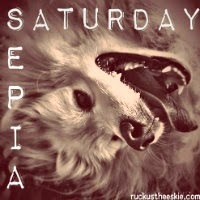 Ruckus the Eskie: Sepia Saturday #36: SQUIRREL? Ruckus, like most other canines, are quite alert when it comes to squirrels. Here is a profile pic as Ruckus stares intently at the little rodents scurrying about the Yosemite Valley trails. It even looks like his fur is raised in anticipation! One day you will catch one, my friend. One Day. He's so cute! My girls love squirrels, too!! Tree Rats!! Chloe can spend HOURS watching HER squirrels!! Beautiful photo of you Ruckus!! OMD did someone say SQUIRREL?? ?/ One day my fine friend, one day. Hope you have a fun long weekend and that your weather is great! Hey, about those squirrels...they're "no, no's" here too. Let me off the leash then MOM LOL. Go get him!!!! BOL!! Have a great weekend! He is on high alert indeed. Have a wonderful Saturday. We feel your pain, Ruckus. We'd like the freedom to catch at least one of those too. Squirrels are fast - even for us cats! Looks like you are playing "statue" to throw the pesky tree rat off his game!! That is one very intent look! My dog Sophie is half American Eskimo and she has that exact same intensity. She's our chief security dog and is sure to alert us when any little critter or human is nearby! I'm sorry to report that Isis killed a squirrel this weekend )-: Somehow it fell out of a tree & I guess she couldn't help herself. Happened so fast.